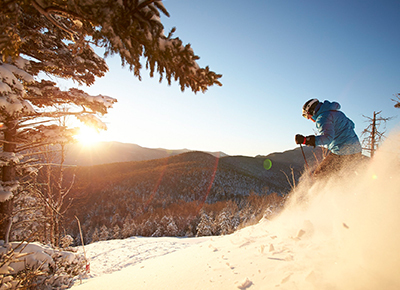 RELATED: The 23 Best Ski Resorts in the U.S. The luxe resort town of St. Moritz is one of Europe’s most famous ski destinations. It’s been the host of the winter Olympics twice, and it’s even where James Bond once raced down the wintery slopes to save the day in The Spy Who Loved Me. Visitors will find high-end shopping, dining and resorts, including the iconic Badrutt's Palace Hotel, which has overlooked the town since 1896. Those traveling on a budget can find less pricey rooms at Hotel Languard St. Moritz, located a quick walk from the ski lifts. Val d'Isère stretches through the French Alps right up to the border of Italy, offering endless possibilities for beginners and expert skiers alike. There are nearly 200 miles of ski runs, and newer skiers can get lots of help at the resort’s ski school. There’s also a lively nightlife, with tons of great bars and restaurants popular with visitors throughout the winter. Rent a chalet from Mountain Adventure Lodges if traveling with your family or bigger group, or try the Hôtel Le Blizzard for a rustic but elegant experience. Thanks to its location in the Italian Alps, the ski resort in Livigno opens its runs from November through May. There are 31 lifts to access downhill and cross-country skiing, and the resort is known for its ski instructors, who can help you perfect your parallel stance. There’s also night skiing, a snow park and the dynamic Lupigno Kid's Club, as well as heli-skiing and snow-shoeing. Book into the Park Chalet Village or Hotel Sonne, and indulge in après-ski at Stalet, a true institution that features a heat terrace. Ascend to 6,131 feet above sea level in Alpe d'Huez, where visitors can find a range of slopes as well as snow parks and ski lessons. It’s not overly fancy, so plan to keep things low-key at eateries like Pinocchio Pizzeria and Smithy’s Tavern Bar and Restaurant. Grab a room at the Chamois d'Or Hotel, a quaint chalet-style hotel with rustic-chic decor (think leather and antlers). Don’t miss après-ski at La Folie Douce, which opens its doors daily at noon.